Dragon Ball Super: Episode 3 "Where Does the Dream Pick Up? Find the Super Saiyan God!" Review – AiPT! I first want to mention something I haven’t talked about before: the music for Dragon Ball Super. The opening sequence is perhaps my second favorite Dragon Ball sequence to date (second only to Rock the Dragon, which I grew up on). However, I feel that Funimation does a disservice to its fans by not providing the subtitles to the opening and closing sequences. If you have watched the subtitled versions of the episodes (available on Funimation’s website as well as elsewhere) you can find the subtitles for all of the songs, not just the episodes themselves. The dubbed episodes at least provide the original music though. One thing that drives me nuts is that they cut off the closing credits songs as well. This is likely a Cartoon Network thing, since the closing credits are not all that important to the series. But I enjoy the music, and the closing credits are often changed as Super progresses along. Lord Beerus and Whis: Beerus now appears to be confused on to what the name of the “Super Saiyan God” really was (counter to his assertion at the end of episode 2). We also find out that Whis is the fastest being in the whole universe, however they don’t seem to mention Goku’s “Instant Transmission” trick, which he learned from another alien race. This trick clearly is not a type of speed since Goku could essentially travel faster than Whis with it. Old Supreme Kai and Kibito Kai: In a bout of exposition we find out who Beerus really is. Old Supreme Kai states that to counter the gods that create life (the Kais essentially), there is Beerus the Destroyer, whose only purpose is to destroy life with no reasoning to whom he destroys. Beerus is “bottled chaos”, whom they want to keep bottled. This means keeping him away from anyone who would willingly shake that bottle and goad him into a fight. Someone like … Goku. Through this exchange, we learn that only gods can feel the energy levels of other gods, so Goku won’t be able to determine how strong Beerus really is. King Kai and Goku: King Kai calls the Old Supreme Kai to let him know Goku is there. In the process of calling the Kais, King Kai is overheard by Goku, who then wonders about who this Beerus is. However, King Kai is able to distract Goku by yelling at him about how Goku killed all of them (King Kai, Bubbles the monkey, and Gregory the bug thing). This reminds Goku of how he brought Cell to King Kai’s planet to explode, in yet another obvious clip from Dragon Ball Z. Through this conversation King Kai diverts Goku’s attention from who this Beerus guy is. Lord Beerus and Whis: Back to Lord Beerus and Whis. They have arrived back on their own planet, of which we get the first view in this episode. They decide to talk to their “Seerer”, an oracle fish, about what the name is for the person in Beerus’s dream. The Seerer confirms the name of “Super Saiyan God”. Whis states there is no person who exists by that name at this time, and that almost all of the Saiyans are gone. Wiped out by Freeza, who blew up the Saiyan home world, Planet Vegeta, at the bequest of Beerus. As a side note, Beerus has been to Earth before and killed the dinosaurs. However, this seems to contradict much of the early episodes of DBZ, which showed that many dinosaurs still lived in coexistence on Earth. In another bout of exposition (with more low quality DBZ animation stuck into the episode) Whis shows Beerus Goku’s battle with Freeza as a Super Saiyan, and Beerus decides to travel to the King Kai’s planet to meet this Goku. The Z Gang: We get a reunion of many of the Z gang reunited for Bulma’s birthday party. A party complete with many prizes, including a “mystery prize”. All have arrived at the party except Vegeta and Goku. 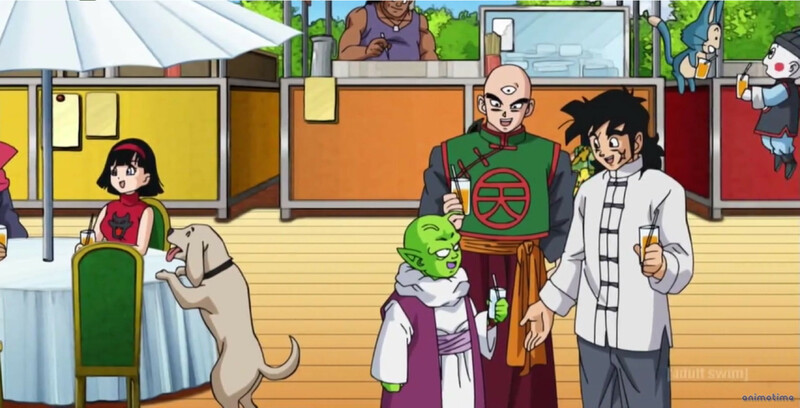 Goku and Vegeta are still off training (Goku at King Kai’s and Vegeta in his training room) while Beerus and Whis make their way towards King Kai’s planet. In half a day, Beerus has destroyed eight worlds. A being of extreme strength, Beerus was the one who trapped Old Supreme Kai in the Z Sword (during the Majin Buu saga). One of the immediate differences between the series and the movie is that King Kai is the one explaining what the Gods of Destruction is. This means that Goku knows who Beerus is immediately, instead of it being hidden from him. The movie then shows the first waking of Beerus the Destroyer, even though he is mentioned as being awake earlier in the movie. Likely we are going back in time a little. The series, it appears, took a slight detour from the movie, probably because they wanted to show Beerus already awake. Beerus had set an alarm for this time specifically to wake up. In the movie, Beerus also knows much more about his dream and links it to Goku almost immediately upon learning about him. Beerus heads off to visit Goku on King Kai’s planet, shortly after confirming with the Seerer. In line with the series, Bulma is also having a birthday party with everyone we had known from DBZ, except not on a boat this time. There is an extended scene with Mr. Satan and Dr. Briefs, which is interesting, since Dr. Briefs doesn’t even have any speaking parts in the series. We start to pick up steam in this episode, moving towards to the one thing that everyone is waiting for: the fighting–because, in all its essence, that is the heart of the Dragon Ball franchise. Beerus is headed right for Goku, in a hopefully epic showdown and Vegeta (barely in this episode) is in constant training mode. Rewatching the movie though, I am stunned by the degree of difference between the DBZ clips that are shown. The movie also shows flashbacks to DBZ, however the quality actually holds up fairly well to the new animation. In Super, the DBZ flashbacks are horrible. It’s as if they took some old VHS tapes (look those up kids) and decided that the quality was good enough. Overall, the best episode so far (out of the 3) but still a while to go before they really get going. Did you like episode 3 of Dragon Ball Super? Share your thoughts below! Where Does the Dream Pick Up? Find the Super Saiyan God!